Notes on the historical-cultural patrimony of the Fifth Region of the Aconcagua river,"Valle de Chile". This page seeks to give contributions and opinions relative to the History, the Paleohistoria, the Arts and other cultural related manifestations with the Fifth Region from Chile. We hoped these contributions to be of their interest. Yours opinions they will be welcome. Each author is responsible for their concepts. "THE CACIQUES FROM QUILLOTA". Ethnohistoric Study on biographies of caciques between 1541 and 1660. "NAME OF QUILLOTANS CACIQUES" Analysis of the meaning in "mapudungun" (language mapuche) of the names of caciques between 1541-1660. "EVOKING VALPARAÍSO". 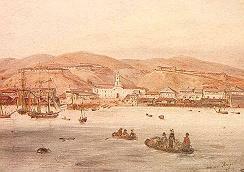 Synthesis of the Valparaíso history , first port from Chile, between 1536 and 1910. "The discovery of Easter Island and the historical context that frames it". Publicated in Interdisciplinar Seminar for the Scientific Investigation of Easter Island. U. de Chile Valpso. Mimeografiado.20 pp. 1978. "Chinchorro Mummies of complicated preparation from the Natural History Museum of Valparaíso, 3290 3060 years B.C." From Annals of the MHNV. Vol. 14-15: 5-17. 1981. "An before Columbus shovel from Central Chile of the year 1270 A.C." From Annals of the MHNV. Vol.14: 19-25. 1981. "Pangal-2, Andean location from Central Chile. Preliminary notes." Annals of the MHNV. Vol.15: 5-18. 1982. "Twenty years after the Hispanic contact (1561), the natives of Quillota". In "Quinta Imagen", 69. 1992.Viña del Mar. ¿Did disembarks Columbus in the current San Salvador Island indeed? In "Quinta Imagen", 73. 1992. Viña del Mar. THE BEGINNING OF THE WESTERN CONTACTS WITH ORIENTAL POLYNESIA AND BEGINNINGS OF THE COLONIZATION (1520- 1850). Synthesis about the Western presence in Oriental Polynesia. "Traditions of Polynesics trips to Easter Island ", Dr. Alfred Metraux, translation of "Ethnology of Easter Island"
"LA CRUZ-3, archaeological rescue in Pocochay", Commune of La Cruz, Province of Quillota. Field's activity carried out in 1984. The author, don Jaime J. Vera, residing in Valparaíso, Chile, is a Professor in History and Geography U.CH . and besides being devoted to the education, he has investigated long years in the fields of the Regional History, the Etnohistoria, the Paleohistoria and Archaeology, and carried out diverse publications of their discoveries on Etnohistoria and Chilean Archaeology, in Chilean magazines and foreigners. He is member of the filial Valparaíso of the Chilean Society of History and Geography, investigator credited in the National File from Chile, founder and President of Center of Studies and Investigations New Humanism, CEINH, of Viña del Mar ; belonging to ICCOM-Unesco, etc. He had also carried out numerous museums exhibitions and worked several years in Museums of the Fifth Region of Chile.